On its last day in town, officials are trying to figure out how two zebras with the UniverSoul Circus got loose from their site at Fairmount Park. PARKSIDE, Penn. -- On its last day in town, officials tried to figure out how two zebras with the UniverSoul Circus got loose from their site at Fairmount Park in Philadelphia. The animals were seen gallivanting on Sunday in the area. They were spotted in a Planet Fitness parking lot, then running down a neighborhood street and even at a KFC on City Avenue. Witnesses took to social media to chronicle the bizarre scene. 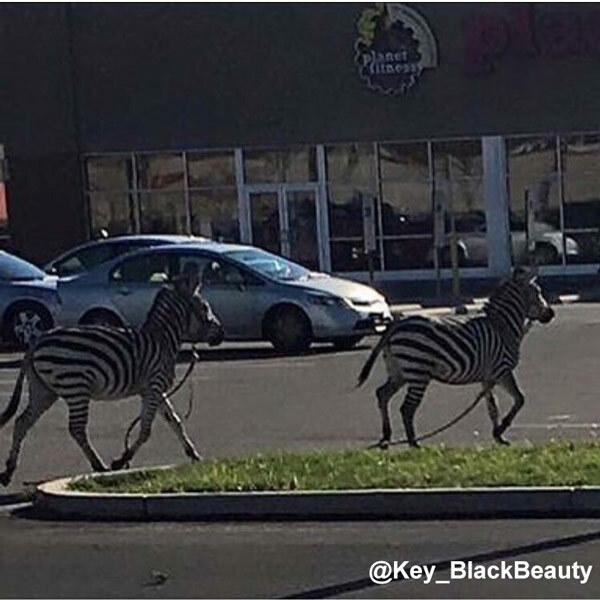 Sister station WPVI-TV had cameras on location as officials captured the zebras, 30 minutes after their short-lived escape. So how did they get out? The circus told WPVI-TV that's what they're working to uncover. But that's little comfort to protesters with Animal ACTivists of Philly. The group said the circus has contracts with these animal acts and are not surprised this happened. Police say two zebras that escaped the circus in West Philadelphia have been captured. "Wild animals in circuses - that's expected to happen - you can't control wild animals," said Jackie Cane with Animal ACTivists of Philly. Some say their brief escape could have ended worse. "They saw a chance to escape, took a run for it and then ended up in traffic, and people probably honking at them, almost causing accidents," said Marianne Bessey with Animal ACTivists of Philly. A 19-year-old trapeze artist who fell 30 feet into a crowd last week during an UniverSoul Circus performance has been released from the hospital. The incident comes weeks after a UniverSoul Circus trapeze artist was briefly hospitalized after falling into the crowd during an Oct. 31 performance. Two zebras reportedly got loose from the nearby UniverSOUL Circus on Sunday. In this case, there were no reported injuries, but activists groups such as PETA are calling for the circus to retire animal acts and for the U.S. Department of Agriculture to investigate the incident immediately. "Yet again, animals have escaped a circus and been chased through a city they never should have been taken to in the first place. UniverSoul needs to retire its animal acts immediately, and all kind families should refuse to buy a ticket to any circus that exploits animals. PETA is asking the U.S. Department of Agriculture to investigate immediately to ensure that the animals are receiving veterinary care and have safe and proper enclosures."